Full disclosure: I’m a contributor to this book. 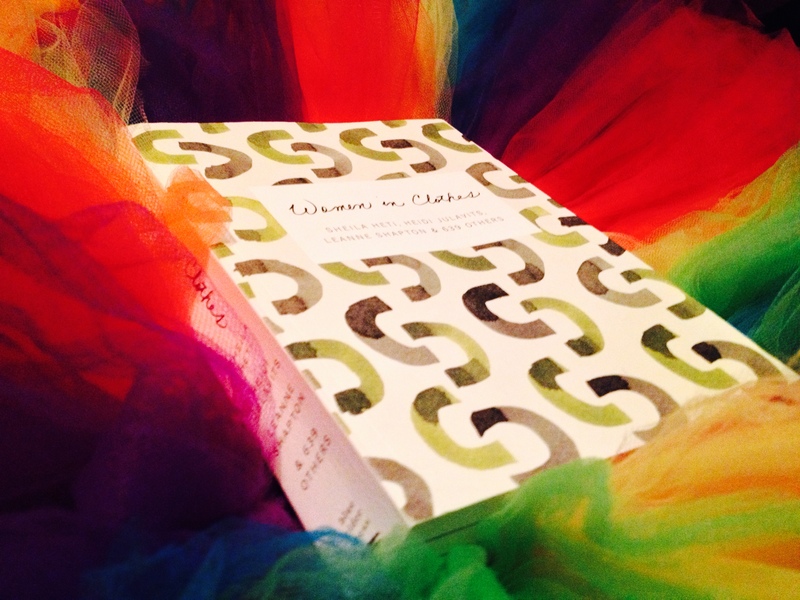 Women in Clothes is a book by Sheila Heti, Heidi Julavits, Leanne Shapton and 639 other women who have an interest, an affiliation with, or even something vague and artistic to say about clothes. The book is a gorgeous tome dedicated to the philosophy of style, taste and fashion. I was thrilled when I got it in the mail. It felt good to hold. The weight was solid, the surface matte and the water colour simplicity of the cover made it feel important. Of course, being completely self-centred the first thing I did was flip to the back to look for my name in the contributor list. I felt the thrill of seeing my name in print and I flipped around to try and find my quotes. Then I felt embarrassed at my own selfish enthusiasm and proceeded to read the book cover to cover. It was fascinating. It felt like a sepia-toned stroll through other women’s lives and memories. It was intimate and close, brave and heartfelt. All the stories and interviews and snippets were stunningly curated so they had a seamless feel. No underwear lines to be seen. I have to admit it was sometimes hard to pick the book up. I’m a fiction lover by nature and the whole thing seemed kind of intimidating and I guess I felt a hint of shallowness just realizing how much I care about my own personal style and the fashion philosophies of others. But I kept picking it up because there was a remarkable honesty to it and there was a feeling of wisdom that came from both the thoughts and feelings of all the women who fill these pages, but also from the editors who somehow made what could be an incredibly shallow subject deep. Some of my favourite and most moving moments in the book came when I felt someone’s voice was particularly clear; a son interviewing his mother and subtly imposing his ideas onto her, an Isreali soldier giving fashion advice, a five year old discussing her very strong opinions on style, a woman talking about her deceased partner as though he had always, and would always be a part of her mind and heart. The pages were filled with remarkable insight, charm and passion that took me to many different places emotionally and made this book both a pleasure and sometimes a struggle to read. It was also strange to see my own words in the mix. When I read them there, in context with the rest of the book they seemed to fit so perfectly, as though we had all written a giant poem together, as one mind with hundreds of different fingers. I didn’t remember writing those words in the first place and I felt a sense of fizzy detachment from them. I was a ghost haunting myself. Of course as I was reading I couldn’t help comparing my ideas and tastes to those of the contributors. I looked hard for people who might share my particular sense of style—love of bright, gaudy carnival colours and rainbows and tutus. I wasn’t surprised when I didn’t find many who matched with my style but when I looked deeper I realized there were many people who shared my philosophy. The prevailing attitude I felt from the book is that clothing matters; as an inner expression, as a set of hopes or ideals, as something more than just the fabric we drape ourselves with to ward off the cold. Clothing matters. Where we get it matters (as so heartbreakingly illustrated by the interviews with sweatshop workers). How we wear clothing matters. Who we are beneath the clothing matters. Clothing is an art form, a choice, a challenge and I was amazed to see all the ways the women in this book embraced that. I was thrilled to be a part of this project and stunned by how beautiful, meaningful and thought-provoking the book turned out to be. Congratulations to the creators/editors and the fabulously honest contributors for creating such a lovely work of art. I’m not a crafty person. I can barely sew, I can’t draw and I can’t even cut in a straight line. I don’t have the patience to knit, I can’t fold very well (although Ben and I once folded a thousand paper cranes – half of mine looked like turkeys) and I don’t have a mind for music. We play Mythic from time to time (a free association role playing game) and I’ve been known to LARP (Live Action Role Play), but as of right now I don’t do either with enough frequency to call it a hobby. So really, when it came to the question of my ‘secret hobby’ for today’s post, I had little to offer up from the depths. Right now I work a lot, write a lot, make videos and watch TV when we can fit it in. But none of those things are hobbies particularly, so what would I call my hobbies? The first is walking. I love walking. I love walking because it often leads to adventuring. When I was traveling I hitchhiked a lot and the thing about hitchhiking is that it’s hard to do it in the city. So I’d get dropped off at one end of a city and then I’d have to walk to the other end to keep on going. With a heavy traveling pack, this was not the most fun, but it fostered a love for walking that I still carry with me. When you’re walking you get to see things you never would have in a car or on the transit. It forces you to look around at the world and offers you the opportunity to take a different path. I’ve always loved the idea of a walkabout and sometimes the most liberating thing in the world is to just pick a direction and walk. Walking allows you to think and breathe and explore. Ben and I walk whenever we can and our most recent claim to fame is walking straight across the city from the Beaches to Etobicoke. 25km in 5 hours. We learned we walk 5km an hour, very satisfying. The second is fashion. I don’t mean to say I am some sort of Dolche & Gabanna wearing fashionista. Goodness no. Like walking, I like fashion because it allows me to take a different path. When I was a kid my Mom dressed me. I was made to wear these flowery, lacy atrocities that still make me shudder to this day, but occasionally she’d put me in something cool. My overalls in kindergarten, my Peter Pan outfit in grade three, once I had shoes that had a pocket in the tongue and I was in heaven (I would put pennies in the pocket and call it treasure). I remember my fashion liberation well, it was grade seven and I went downtown for school and lucky for me, my school was right beside kensington market. From there it was vintage tops and rainbow tights. I discovered sparkles and ox blood doc martins and hair dye. My graduation dress in grade 8 was a bright blue number and I dyed my hair a shocking orange to accompany it. From there my love for cool clothes grew. Now I have wings on my shoes, a bin full of striped tights and tutus and a handful of adorable dresses which I refer to as ‘clown chic’. My inspirations are the circus and the world of fairies and the names of my favorite clothing stores involve the word ‘fairy’ or ‘cyber’. I guess there’s a theme to the things I like: liberation. I like being free to think and act and do what I want. I like making choices for myself and forging my own path. So whether on foot or in fashion I would definitely say my not so secret hobby is being free. What about you? What do you love?